Birthday Style Girls 9" Square Luncheon Paper Plate 8ct. 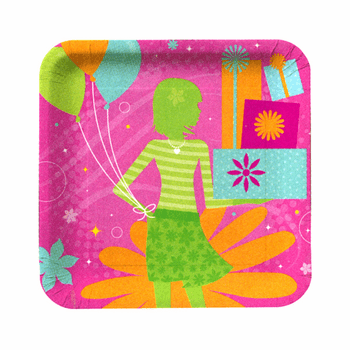 Birthday Style Girls 7" Square Cake Paper Plate 8ct. Birthday Style Girls Happy Birthday Lunch Napkins 16ct. Birthday Style Girls Happy Birthday Beverage Napkins 16ct. Birthday Style Girls 9oz. Hot / Cold Paper Cup 8ct. This pink tablecloth measures 54" x 108"